Successmust be built on a solid foundation. Because life will throw many challenges and difficulties at you as you are working to build your success. The challenges that will be thrown your way can knock you off your path if it is not built on a solid foundation. Even worse, you may get to the end of your journey and be left utterly unhappy with the mark you’ve left on the world. What good is success if you can’t feel good about the way you attained it? Is stepping on other people to get ahead good for your heart and soul? Can you be proud if you misled or exploited people on your climb to success? So what are the essential building blocks in the foundation of success? A person is judged by their actions, and on the strength and weight of their word. How many times in your life has someone given you their word, only to go back on it when it became inconvenient for them? And did your feelings toward that person change? They demonstrated that their word could not be trusted, that they were unreliable, that they couldn’t produce what they promised they would. No one wants to be around people they cannot trust. Integrity is a vital component of success that you can feel good about. Yes, it is possible to be cutthroat and stomp all over the people below you to elevate yourself. However, once people figure out that’s the way you play the game, they won’t go out of their way to trust you. It’s impossible to build anything of meaning or substance without trust and integrity. And even if you do, you may find yourself looking back on what you built with regret and sorrow, because you chose not to honor and respect the people around you. We’ve all done things in our lives that we regret. Maybe it was going along with something we fundamentally disagreed with, perhaps a job that required you to violate your personal ethics, or maybe it is something as simple as making bad decisions with your friends. Maintaining your self-respect is an important part of being successful. You don’t want to be looking back on a life or experiences with regret because you sacrificed your self-respect for gains. It’s easy to lose yourself in the pursuit of money, building a career, networking, or whatever it is you are trying to pursue. But will you feel good about it later? And worst still, the kind of energy and people you attract when you aren’t true to yourself are often bad for you. Not necessarily malicious, just a bad overall fit that doesn’t necessarily align with your values, needs, or desires. Self-respect demonstrates to the world the kind of person you are, which attracts people who will value similar perspectives. Holding on to one’s self-respect requires making difficult choices – but it is worthwhile in the long run. Rome wasn’t built in a day and motivation is fleeting at best. The real key to success is discipline e that is, constructing a plan and engaging in purposeful, meaningful, regular behavior to achieve the goals you’ve set out for yourself. Most meaningful things are constructed by putting small pieces together until you have a much larger thing built. Losing weight? You choose what you put in your body each time you eat or drink and regularly exercise. Career? You attend work each day, adding new skills to your knowledge as time goes on. Relationship? You need to be there for your partner, work together to overcome life’s challenges, and seek to empathize and understand their perspective. You will have far more success in life by embracing discipline than by waiting on something as fickle as inspiration, as fleeting as motivation. Self-care often gets lost in the pursuit of success. Human beings are not meant to exist in extremes for long periods of time. A balance must exist where a person is pursuing their goals while still taking care of their health, wellbeing, and relationships. Burning the candle at both ends just causes you to burn out early, which will derail all pursuit of success or lead to health problems. Successful people do not neglect their health and wellbeing. They strive to get an appropriate amount of rest, eat as healthy as they can, and pencil breaks and exercise into their busy schedules. Those that do not strike a healthy balance may find themselves burnt out or dealing with physical or mental health issues further down the road. The sooner you can strike a balance, the more likely you’ll be able to enjoy your success when you get to where you want to be. Successful people do the work. It is rare for anything worthwhile to be built without a regular application of effort. It doesn’t matter what kind of success you are pursuing, it will always involve work at some level. Want to be a writer? Then read and write regularly. Want to be great at chess? Study strategy and play. Want to become a doctor? You have work and study ahead of you at college. Want to build a business and be an entrepreneur? Plenty of work to be done there as well. How about losing weight? Learn more about nutrition, diet, and exercise; then apply it. Success doesn’t just fall out of the sky. It always requires work. Successful people do the work and strive to do it well. Growth, in relation to success, can cover a lot of territory. We’ve already established that successful people need to commit discipline, knowledge, and work to success; but those aren’t the only components of growth. One must also use their lifetime of heartbreaks, and disappointments as fertilizer to grow a better present and future for themselves. Every single person makes mistakes. Those mistakes can be fuel for regret, or they can provide much needed wisdom and perspective to be a better person. Every successful person experiences failure on their path to success. It’s just part of the process. A successful person makes the choice to use past experiences and failure as fuel to make something better. They view failure not as an absolute end, but as a temporary setback that better informs their future decisions and actions. What do successful people never compromise on? The ability to compromise; to remain flexible and adapt where necessary. Success is often a group effort. Other people are striving for their own goals, working to get through their day, and getting back home to their own lives. We, as people, are connected together on so many levels. And part of working with other people is trying to empathize with their perceptions, looking for solutions that make sense and that everyone can live with. That doesn’t mean that all parties will always walk away happy. It also doesn’t mean that you should always bend when someone is being unfair or trying to take advantage of you. It does mean that we need to be open to new information and work to find the middle ground with other people on their own journey to success. Never be so locked into a vision or course of action where you lose sight of the people around you. A static plan that cannot bend is not likely to stand up to the rigors of the pursuit of success. If you wish to study any course that'll help you work anywhere, you'll need to check out these five courses. The quest to get a High paying job after school is no doubt the dream of every student. There are certain courses that prepare you to work in any field and makes you useful and relevant in any work environment you find yourself. Communication is one course that grooms you to work anywhere and still gives you a satisfying experience wherever you find yourself. As a communication graduate, you can decide to switch lines and do master's program in other disciplines like Marketing which also requires some degrees of communication skills. Also, if you choose to go into Management, Business or even teaching, your communication knowledge and skills will help you communicate your way to success. We believe every Business, Idea, Project, Or Organisation has a NeXt Level of Operation and Execution. A NeXt Phase in its Productivity and Profitability. NeXt Consulting is that Business designed to get there. We work with you for a few days and generate NeXt Level ideas that will immediately improve your Business or Organisation. 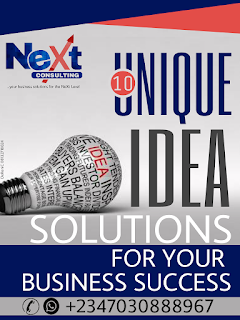 We guarantee you a minimum of TEN (10) unique Ideas that represent the NeXt Stage of operations for your Business or Project. If you really want to be poor as I suspect, this post will greatly help you. If not anyways you can take it the other way round.To be poor:1. Never wake up early. Keep stretching and turning in bed until you get too hungry to continue dozing. If there are no bed bugs, why hurry to get up? 2. Never plan how to spend your money. Whenever you get money, start spending it right away and when it is finished, you try to count and recall how you spent it. 3. Don't think of saving until you have real big money. How can you save when you earn so little? Those telling you to save are not sympathetic to your burning needs. 4. Don't engage in activities usually reserved for the "uneducated". How can you, a graduate, engage in petty trade, network marketing or home-based production? That is for people who never went to school!